The value of a precious figurine can be found more easily since the internet has emerged as a great searching tool. 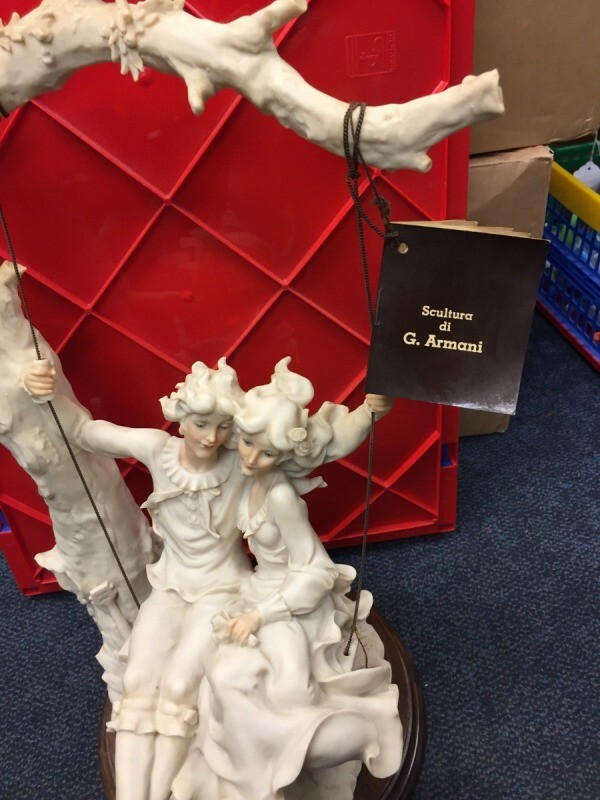 This is a guide about finding the value of a Giuseppe Armani Capodimonte figurine. Can anyone tell me anything about this piece? I am not sure if it's old or not. 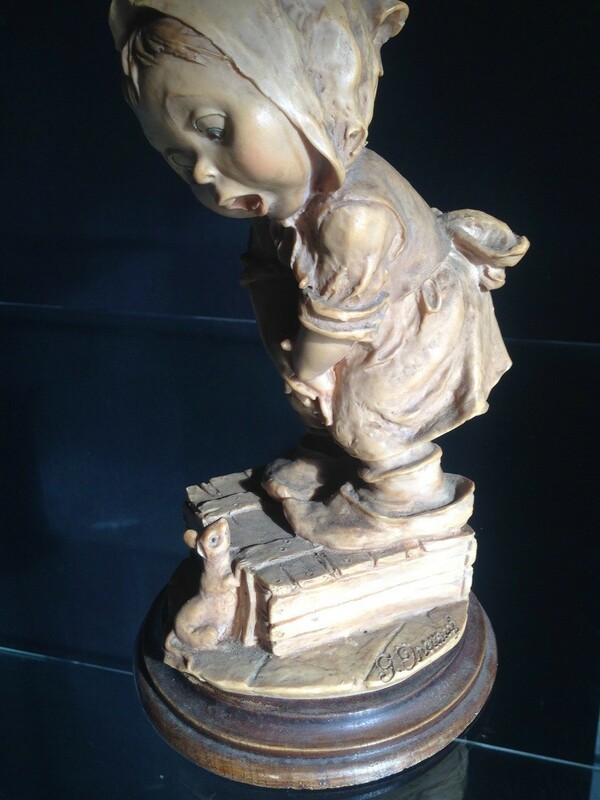 That is a Giuseppe Armani Capodimonte figurine called"Girl Afraid of Mouse" :) Made in Florence, Italy in 1980. It's from Gullivers Travels. 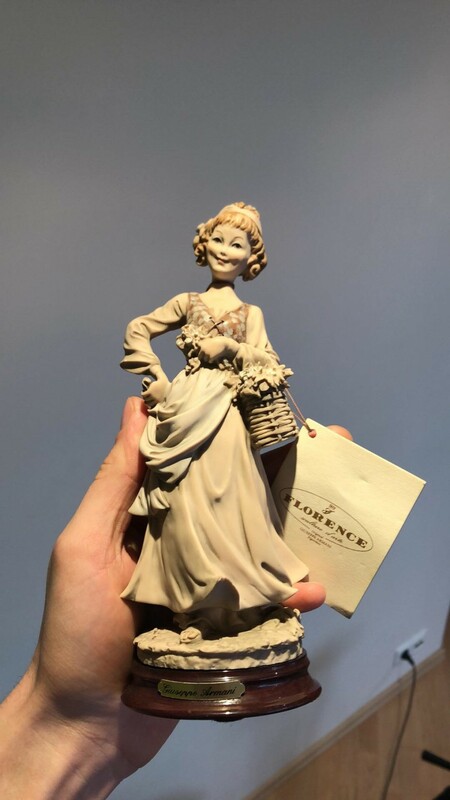 Question: Is This a Real Giuseppe Armani Capodimonte Figurine? I'm looking for some advice please. 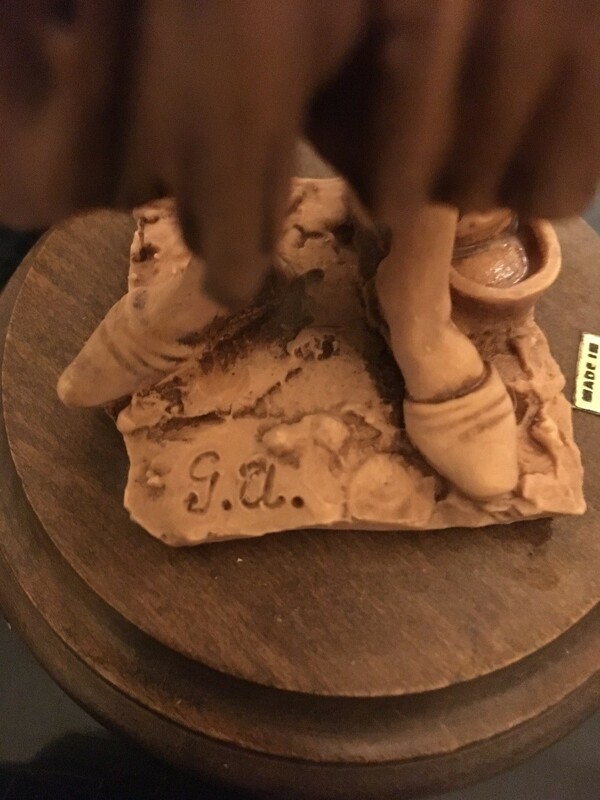 I came across this lovely figurine whilst treasure hunting and noticed the GA initial. 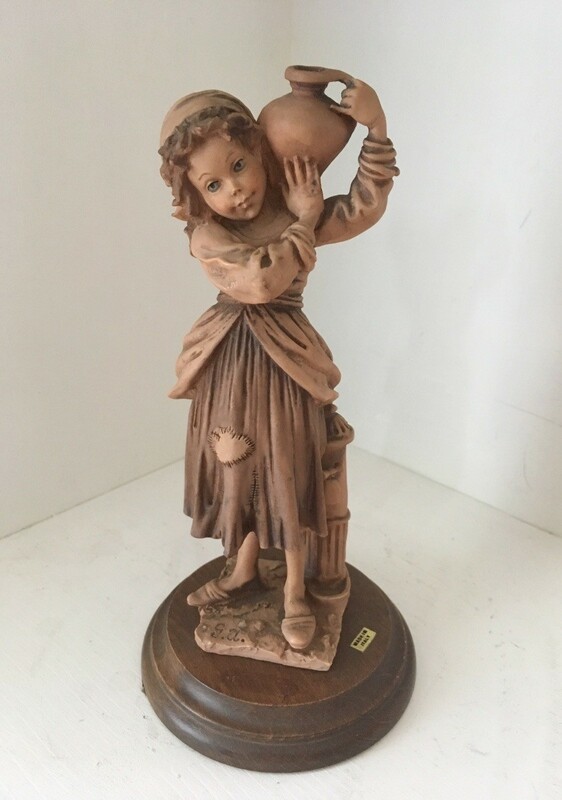 I've had a google search and found the same figurine by Giuseppe Armani, with a capodimonte mark and a little plaque on the base with his name on as well as his initial, but the figurine was painted in bright colours. Mine is painted in much duller colours, I can't find a capodimonte mark and it has a Made in Italy sticker instead of a metal plaque. Is this a real Giuseppe Armani piece I've found please or is it a fake? And ideas of value in pounds sterling please? There are many fakes out there. If I were you, I would take it to a dealer, who specializes in these things. It rings true to what I was trained on when selling capodimonte floral items back in the day...that capodimonte is a style that many artists have used over many generations based on 18th century original works. To determine value, I would take it to a antique store you trust. My understanding is that a true 18th century original would only be seen in a museum..and 99.9% of what we see in the market are style similars by many, many artists and companies. Like any other collectables, value can be all over the place, so someone who specializes in the style can give you the best answer. I wish I could be such an expert, but I am no where near.... maybe some day! Thank you for your reply and information links. I have saved it all for further reading and future reference. Ive recently entered the world of buying and selling vintage and collectable items and Im really enjoying it. Ive come across capodimonte pieces before and yes it is a vast universe to explore! I do my best to sell on my finds with as much research and accurate info as possible as well as a reasonable price to match. Thats exactly what Im trying to do here with this piece. If it is a copy, I will sell it on as such with any info I find on it. In the meantime I will keep hold of it and try and find some experts locally. Since collecting, buying and selling this type of art I feel sure you already know that it is usually considered (in this field) that over 99% of the items seen are fake but sometimes the fake items are also valuable. Of course, it usually depends on the "artist" that made the fake and since they do not usually sign their name it generally takes an expert to identify the "fake" artist's work. I love researching items like this because it broadens my world into fields of the relatively "unknown" aspects of just how many fakes we could be seeing in our travels to museums and art shows. There is so much to be found on Giuseppe Armani that it would take someone a lot of time to just do a little research. It seems the Capodimonte figurine you have is one of the most copied of all his work. One of the most interesting sites that I found was actually an auction site but you do have to join to (email only) to see the past sales as well as the current offerings. It is stated that they do not authenticate any of the pieces offered but it does offer a look at prices that people will pay for pieces that may very well be fakes. You may want to search for your figurine in past sales. I have used this site in the past as it has some very interesting suggestions and information on how to do research. The following site has a wealth of free information but it is very lengthy and he is also selling his books. I believe you will like the information he supplies. I do not know if you currently use any of the free appraisal sites but some of them do supply excellent information (I usually send information to more than one site so that I have some sort of comparison). Here is a link to some appraisal sites that offer free services. I have often used Barneby's because they are so thorough but they do charge $17. Hope you find out it is valuable even if it is a fake. Thank you for your reply and information I too love researching and learning about things that I find. The collectable universe is mahooosive and quite mind blowing but very enjoyable too. Im not expecting this piece to be an original at all, I just like to provide as much correct info as possible when I sell something on. Ive been put in touch with a large antique and collectable shop and have emailed them photos so Im just waiting on a response now. Please share what your expert tells you if you would be so kind!! I love to learn and find the best way to do so, is in judgement free and open sites like this one where there are lots of knowledgeable folks on a variety of topics! Thanks!! Wishing you all the best!! That sounds interesting, as I said before, "fakes" can be valuable too and should not always be discounted as great works of art. Sometimes artists are better at copying than at starting from scratch but that does not mean they do not have talent. I understand how you feel about being honest as a seller, it's just too bad more people do not feel this way. If possible, please let us know about your piece. Unfortunately, Ive had no response to the email I sent to the antique shop yet. 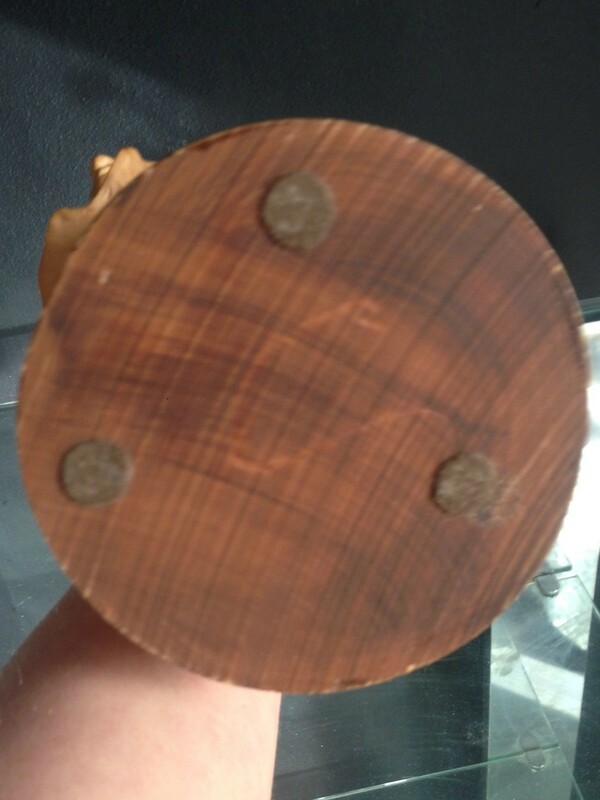 Ive since come across a piece of Japanese pottery too that Id also like to get looked at. I think we may have to spend a day finding antique shops and take the 2 pieces in in person. I dont yet have any trustworthy expert contacts to go to, so several opinions may be in order. Thanks for the update and for sharing your results! Yes, happy treasure hunting!! It is a fun hobby with so much to learn and enjoy!!! Thanks for the update - now you know for sure but maybe next time?? I feel sure someone will still pay just to have a replica as we all like things like this but cannot afford the "real" thing. Happy hunting to you also.. This was recently donated to our charity shop. I am unable to find this particular model online. 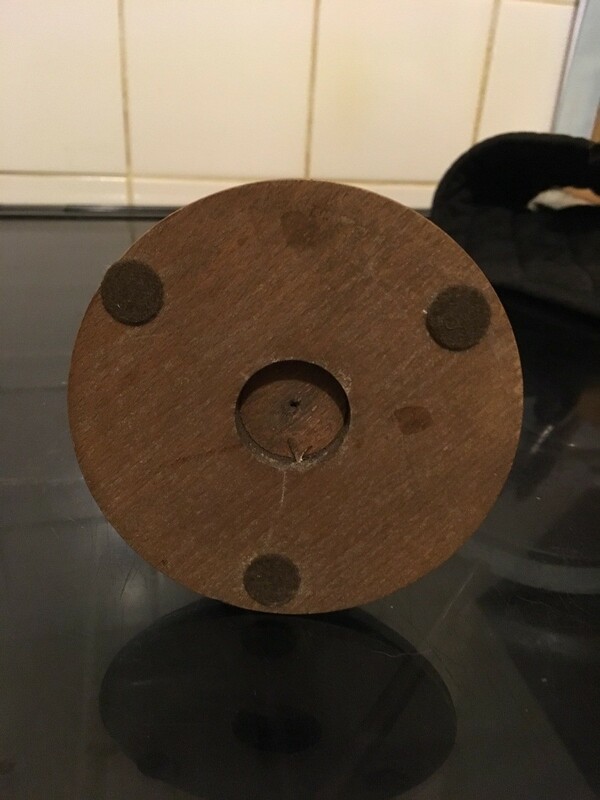 Can anybody help with some information? Value, etc.? They range from $250 to several thousand dollars. Take it to an appraiser. Ebay (on 11/25/2018) shows listings for this sculpture at $233 to $300. And a little more information can be found at this link. www.worthpoint.com/.../capodimonte-couple-lovers-swing-409591432 Looks like you have a treasure! 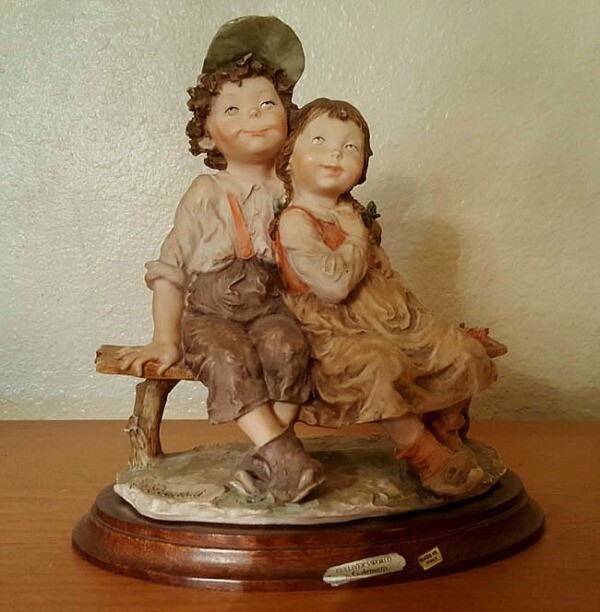 The capodimonte G Armani figurines have mostly kept their value over the years so although their are several listed on eBay and some other sites, this one could still command a decent price. Your figurine may be more valuable in that yours is made in a different finish than others listed for sale. I do not believe your figurine is signed. 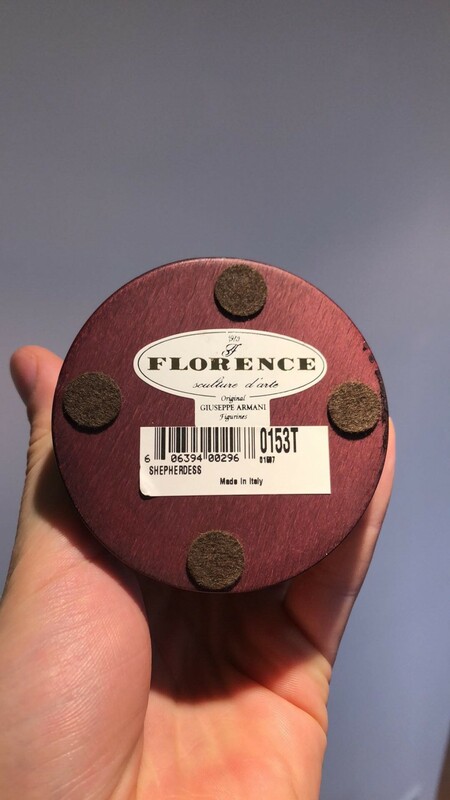 Armani made figures in 8 different finishes so you might find a different finish on any of the listings on eBay or other sites. I have not found anyone stating that one finish is more valuable than another but it is possible there were less made of one finish so that might make it more valuable. Here is one figure that was listed in 2017 but did not sell and there are several others but still not a bad sign as sometimes it just takes the right person seeing the listing. For items like this I like to check Replacements but they do not have one of these at the present time. I would suggest you contact Replacements and ask what they will pay for your figurine as this will probably be the easiest and safest way to sell this figurine. Replacements will give you a good price but you will have ship very carefully so as not to damage an item like this as they are very fragile. 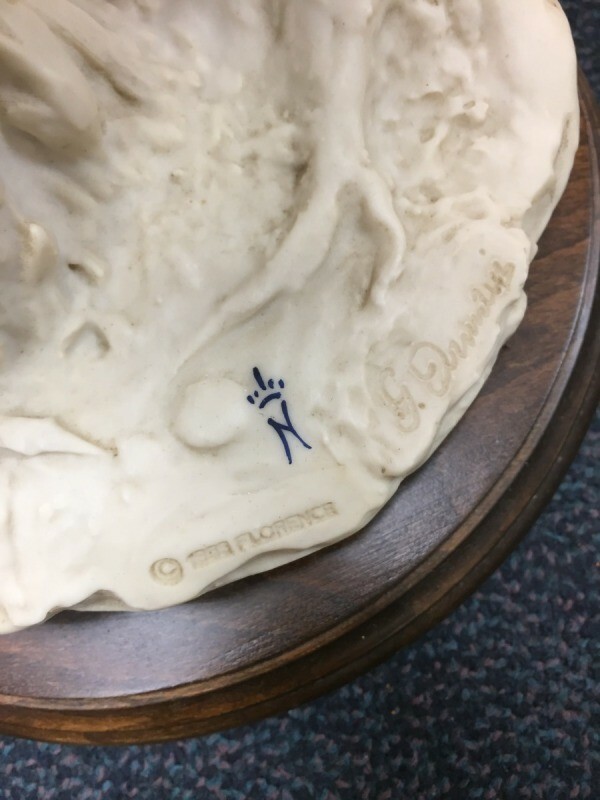 I have several Armani Disney figurines and Replacements has offered a very good price so I know they are pretty fair but they do intend to make money also so do not expect the same figures you see on some of these sites (unsold figurines). Here is a link to their customer service. Here is a link that gives a lot of information about these figurines. Thanks for sharing. I know there was a very long, in depth post on Thrifty Fun about this brand a while ago and I am not able to lay my keyboard on it at the moment. I will keep looking. I will give you the little I know, as there is a bit of buyer beware with the Giuseppe Armani Sculpture world. Yours is lovely and I hope it is real....so you may want to take it to have a professional look at it because even the best experts have a hard time telling from photos. My concerns are two fold...the paper tag looks black, and I always knew the real ones to have tags that were more of a chocolate brown or cream with gold and black. That could just be a bad color in the photo and it is brown. My second concern is many of the 1980 versions...which if I zoom on your date right...were more colorized than pure white. Yours has some color to their faces, but not the bodies. Many of the ones we sold back in the 1980s had more color to them, muted color, but color nonetheless. There were some pure white, but this one just does not feel right to me. I hope I am proven wrong....it has been well over 25 years since I sold them when they were popular items at the high end Hallmark shops and memories fade! Please post back what you learn from an expert. Most reputable antique dealers should be able to help you...call first to make sure they have a ceramic/porcelain/bisque expert when you go! 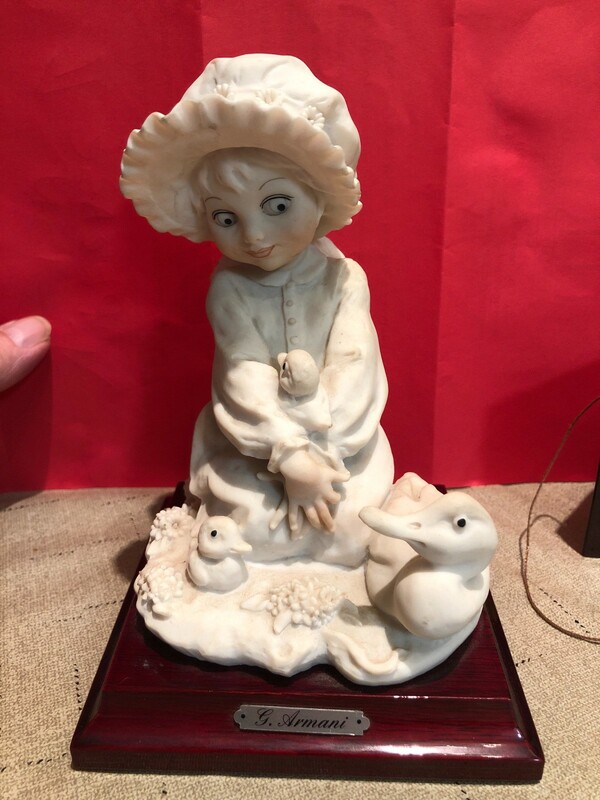 I have a Giuseppe Armani Capodimonte figurine of a girl holding ducks. Is this worth restoring and cleaning up? 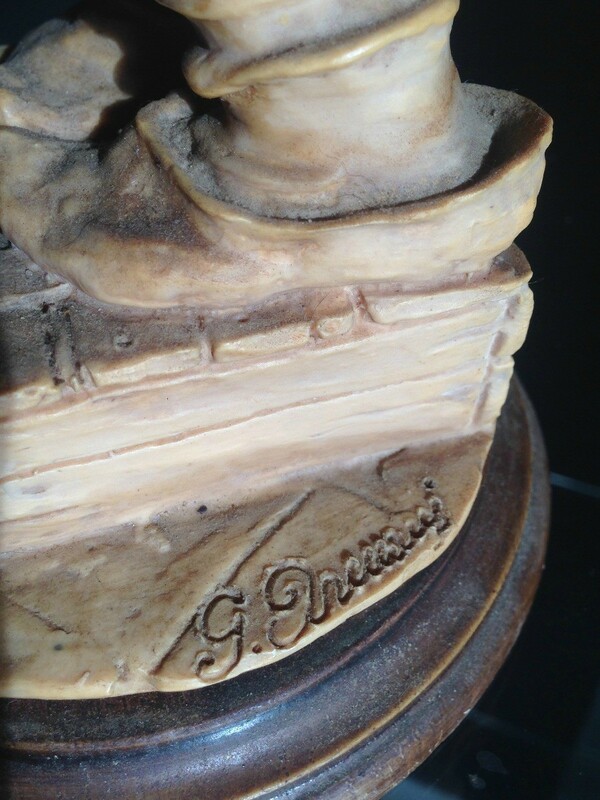 What is the value of this Giuseppe Armani figurine? Can someone help me find out the value of these figurines? My friend wants to sell them, but doesn't know where to start. Figurines range from $25-$50 on eBay. 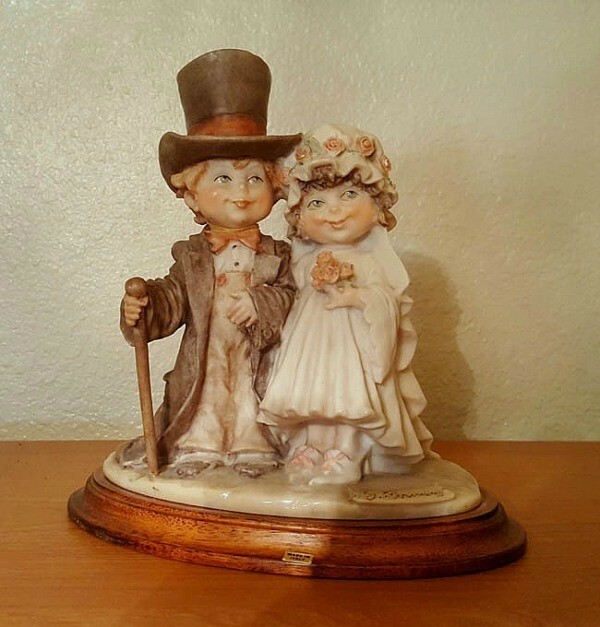 I would put a search on eBay, describe you item under figurines, you will find what similar items are priced at and might even find one exactly like yours. If you could tell us who they are made by or if there are making on the stand this would also help to determine the price of them. As it stands right now we can only give you an idea of what other's are selling them online. If you look on eBay they normally start around $5 all the way to $50.